The recent review of Australia’s Ozone Protection and Synthetic Greenhouse Gas Management Act enables the phase-down of synthetic greenhouse gases (SGGs) under the Kigali Amendment to the Montreal Protocol. This provides the air-conditioning and refrigeration industry with welcome certainty about the next steps in reducing harmful emissions. Since the 1990s, Australian industry has overseen an 85 per cent reduction in direct CO2-equivalent emissions, achieved by phasing out ozone-depleting CFC and HCFC refrigerants under the Montreal Protocol. Now, under the Kigali Amendment, the phase-down of high global warming potential (GWP) HFCs will achieve a further 85 per cent reduction of CO2-equivalent emissions by the 2030s. 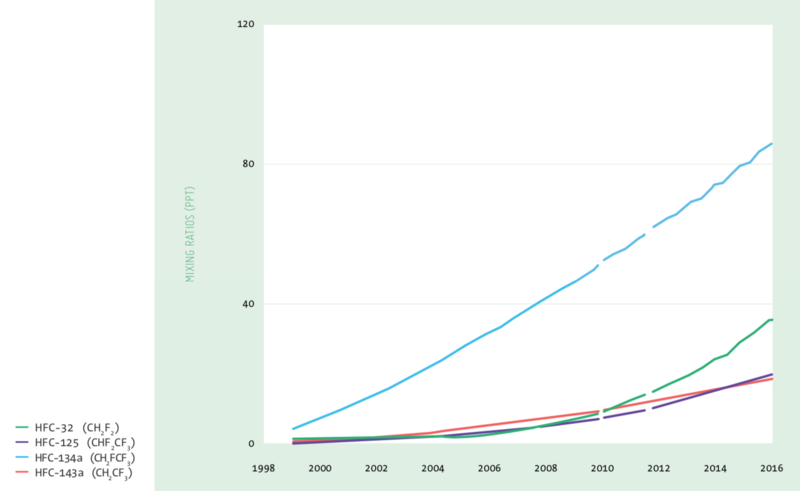 The availability of low-GWP alternatives, and the rapid development of new ones, will make this transition achievable. 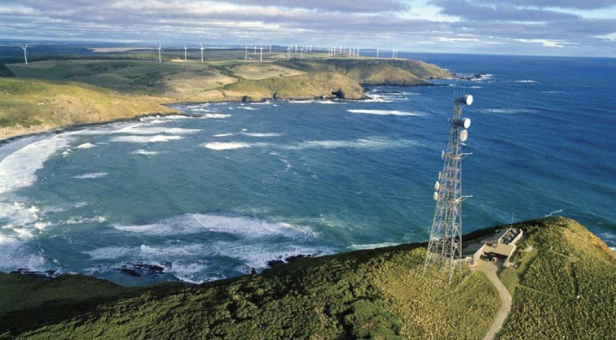 The CSIRO Cape Grim facility in Tasmania started sampling air more than 40 years ago. In that time it has taken more than 3 billion measurements, including tracking atmospheric concentrations of various types of HFCs. According to Cape Grim data, R134a accounts for almost half of all airborne HFCs. Between 2015 and 2016, atmospheric concentrations of R134a increased 6.9 per cent. Australian emissions of R134a had begun to decline after a peak of 1811 tonnes in 2009, but are now on the increase, rising from 1438 tonnes in 2013 to 2125 tonnes in 2015. Increasing concentrations of all HFCs have been recorded in the background atmosphere at Cape Grim, an accurate reflection of global background atmospheric changes. Global HFC emissions exceeded 400 k tonnes per year in 2015, an increase of 4.0 per cent over 2014 and contributing to an average emissions increase of almost 20 k tonnes per year since 1995. Emissions of all major HFCs (R23, R32, R125, R134a and R143a) increased between 2014 and 2015, while R152a emissions resumed growth after several years of stability. 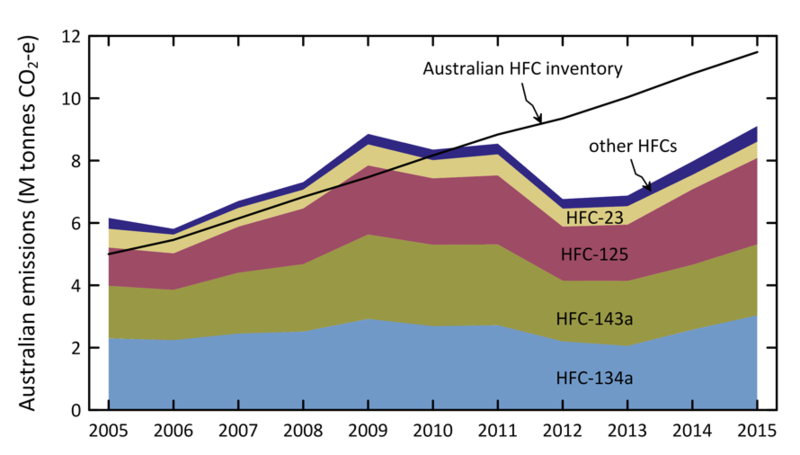 As Australia embarks on its HFC phase down under the Kigali Amendment to the Montreal Protocol, emissions of HFCs including R134a will start to decrease again while emissions of lower GWP alternatives will increase. Cape Grim data has already shown significant increases in R32 emissions since 2013, probably due to this refrigerant’s popularity in new air-conditioning systems and its presence in the refrigerant blend R410A. In Europe, trace levels of HFC-replacement refrigerants R1234yf and R1234ze have already been detected in urban and background air, and are likely to soon be detected at Cape Grim.